The ZBrushCore interface is designed so that everything you need is close at hand. On the left side are the selector thumbnails. These show what’s currently selected and clicking a thumbnail displays a pop-up window so you change the selection. On the right side of the interface are the navigation and display buttons. Along the top are the mode buttons and sliders and above those are the main palette buttons. Along the bottom of the interface are the most commonly used brushes. 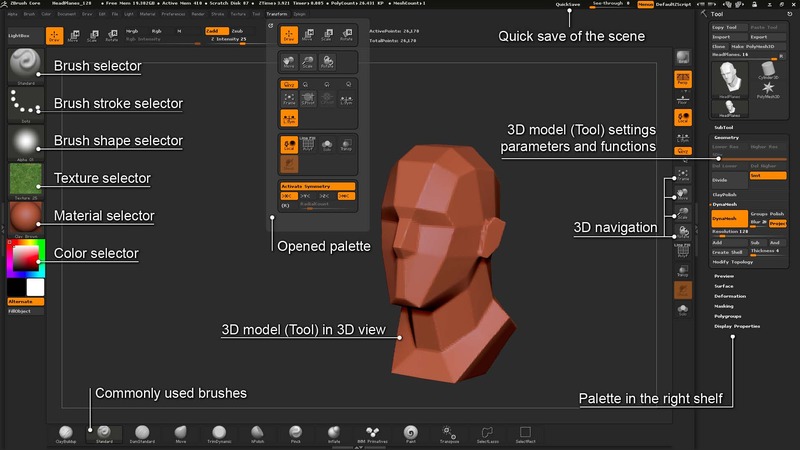 The Tool palette, shown in the right tray, is for 3D models and model creation tools. These include Primitives (mathematically-created shapes which you can adjust) and ZSpheres (a unique creation tool described later). Clicking the LightBox button shows or hides the LightBox content browser. This has separate tabs for the different file types. Double-click a thumbnail to open the file. To import a 3D file click the Open File button. To start sculpting or painting, make sure the Draw button at the top left of the interface is turned on. With the Standard brush selected, you should be able to begin sculpting. Often it will be useful to have symmetry turned on, so that everything you do on one side of the model is mirrored on the other side. Press X on the keyboard to turn on symmetry, or set it using the options in the Transform palette. If you make a mistake you can undo it by pressing Ctrl+Z on the keyboard, or to redo press Ctrl+Shift+Z. The Undo/Redo buttons are also available in the Edit palette. It’s a good idea to save your work often while working. To save your work go to the File palette and press Save, or hit Ctrl+S on the keyboard. This saves all your work in a single project file. You can open a project using File >> Open or by pressing Ctrl+O. Note: Opening a project will replace the current project, including any 3D models, so be sure to save first! ZBrushCore provides an easy way to regularly save your work. Pressing the QuickSave button at the top right of the interface will save your work without you having to enter a file name. A new file is created so that any previous QuickSave files are not overwritten (until the maximum is reached, which you can set in the Preferences >> QuickSave sub-palette). There is also an AutoSave feature which will save your work automatically at regular intervals. This works in a way similar to QuickSave and you can set the interval in the Preferences. You can reload QuickSave and AutoSave files from the QuickSave tab in LightBox.